I haven't had a lot to write about lately so here's a little project for you. 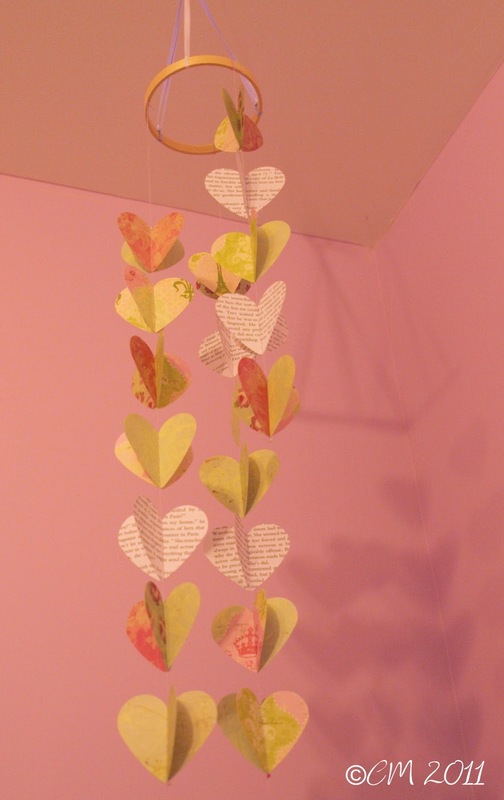 This homemade paper mobile for my daughter's room was inexpensive and easy. Punch out hearts (or whatever shape punch you've chosen) from papers. Line hearts up vertically, singly or two hearts together. I left an inch or two between. 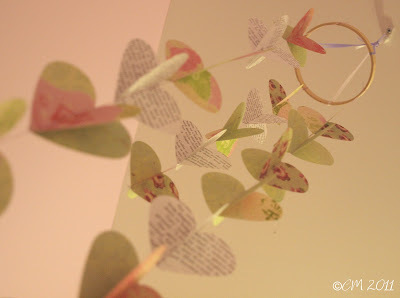 Using a sewing machine, sew paper hearts in a row. Detailed instructions on how to do this can be found here. Leave a lot of extra thread on the top and bottom. Once sewn, double hearts can be separated and folded outward, giving a butterfly effect. Make 3 garlands of various size. Tie a small bead to first and last heart of each garland. Trim thread of bottom heart. Take the inner hoop from purchased embroidery hoop. Tie each garland to the hoop. You'll have to slide the garlands around to get the look you want. Now cut three very long pieces of ribbon. Tie ribbons to hoop. Now the tricky part, getting the mobile balanced. Hold the three ribbons by the ends, leaving the mobile dangling. Is it balanced? If not, slide the tied end of the ribbons around on the hoop until the mobile hangs right. Tie the three ribbons to a small plastic hoop for hanging. Viola! You're ready to hang it from the ceiling. Enjoy! This looks like a lovely and easy project. I'm definitely going to try to make one. Thanks for sharing!